Tony (Jonathan Lipnicki) has just moved to Scotland with his family. He’s not thrilled about it, and he has nightmares about vampires to boot. So, he’s especially unhappy when a bat flies into his room. 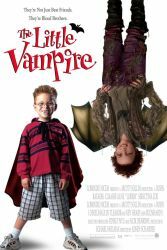 The bat turns into a vampire boy named Rudolph (Rollo Weeks). Rudolph and his vampire family are looking for the second part of an amulet that could turn them human. To make matters worse, they are the target of a vampire hunter named Rookery (Jim Carter). The quest for vampire animal movies has led me back to a kid’s film. The highlight (and perhaps the only thing anyone remembers about this film) is a flock of vampire cows. Had this movie been made ten years later we’d be seeing a series of cynical sequels highlighting these side characters (Madagascar, Sinister Me, I’m looking at you.) Much like Vampire Dog, the actual vampirism is soft pedaled as much as possible. I’m confused why kid’s movies about vampires seem to back off on the central aspect of what a vampire does. The Little Vampire is shot like an adult film with attention to atmosphere and some legitimately beautiful cinematography. Tony and Rudolph have some chemistry as characters, but Rookery is just an annoyance. The plot is an overcomplicated mess about comets and amulets that really isn't worth dealing with. I was happy to see that this film wasn’t afraid to put its characters in some danger even if it was mild. It’s a weird mess of film and you’re probably best off just watching the vampire cow scenes and moving on.